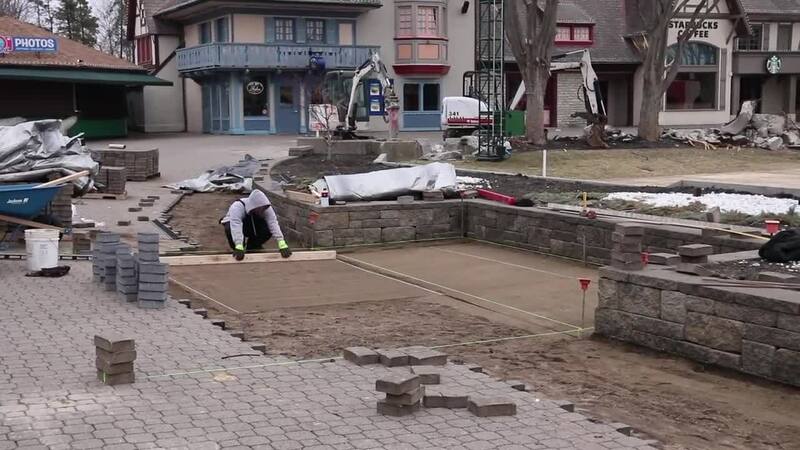 MASON, Ohio — The decades-old front entrance of Kings Island will look new again. The classic charm of International Street will undergo a full makeover by the time the park reopens in the spring, the first complete renovation since the park opened in 1972. Crews are in the process of installing more than 130,000 paving stones, updating each of the buildings' exteriors and enhancing the landscape, according to a news release. Perhaps the biggest updates will be to the Royal Fountain which will be modified for day and evening shows with water that shoots 50 percent higher into the air. The fountain will have 112 new nozzles and 176 LED lights that can be individually controlled. The purpose of the offseason renovation is to bring back the vibe of the park's opening day. "For many of our guests, visiting Kings Island and seeing the Eiffel Tower and Royal Fountain for the first time was a moment they'll never forget," said General Manager Mike Koontz. "This season they'll discover the magic of International Street again, spending more time there than they have in a long time." After the renovation is complete, there will be more room for celebrations and performances in front of the Eiffel Tower, the news release said. Kings Island is tapping into nostalgia for a new attraction for the 2019 season. Park officials announced the return of the antique car ride, to be named Kings Mills Antique Autos, for this coming season. Kings Island announced The Racer, the iconic wooden coaster, is about to become much smoother. Workers from Great Coasters International have been retracking the back turns, including the approach exit hills, with new track and supports. The Racer has been a fixture of the park since 1972. Of course attraction park fans are crossing their fingers for news of a brand new coaster to replace the Firehawk coaster which is coming down this year. No official plans for a new coaster have been announced. With all the changes and renovations, Kings Island is bound to be a popular destination in 2019. More than 5,000 seasonal positions are available for the coming season. Interested jobseekers are asked to apply online at kifun.jobs. NOTE: A previously scheduled job fair for Jan. 19 has been canceled due to weather. The next on-site job fair will be Feb. 9, according to a Kings Island representative.